Really nice, probably my favorite of the compo. It's well balanced: quite original/interesting "okish+" visuals, great music, good progression. I liked this. The cell shaded look and pastel colours give it a nice style. The music is nice too, reminds me of an old Carl Craig track. Nice idea. Less arbitrary colors would have helped the presentation. Pretty good for 1K! I like the colours. Beautifully constructed. Colours <3 and the music is ace. This was pretty much my favourite in the compo. Good music and artistic visuals. Not fond of the colours, really neat music. 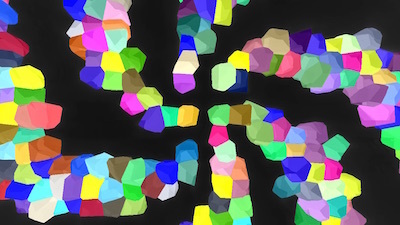 I'd have turned the voronoi cells into pebbles and go for a rock pool or zen garden look. I'm definitely not a person who has a right to complain about colors, so I won't. Definite thumbs up for something new in 4k. Nice pleasants chords too! Obviously not winner-material, but definitely would've deserved to be among the top. page created in 0.015481 seconds with 15 queries.